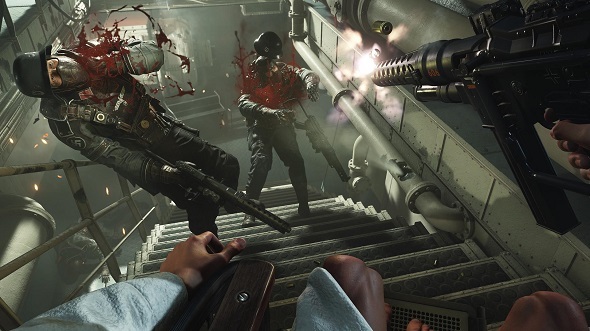 Wolfenstein II: The New Colossus generated enormous, blood-red waves when it released last October. The game’s spirited gunplay, jet-black humour, surprisingly moving story line, and arresting advertising campaign combined to make for one of the most memorable game launches in recent history. 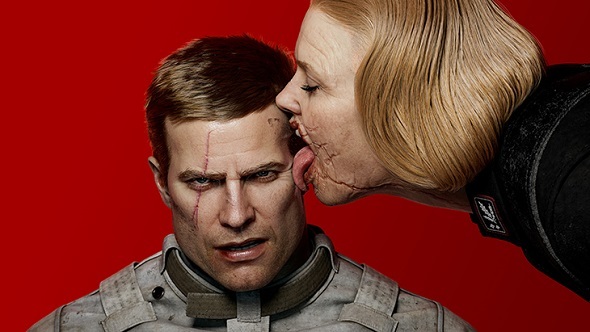 Nearly six months on, we caught up with creative director Jens Matthies to see how he felt it all went, discuss the prospect of a Wolfenstein Battle Royale mode, and find out how those striking promotional images managed to get through the approval process. 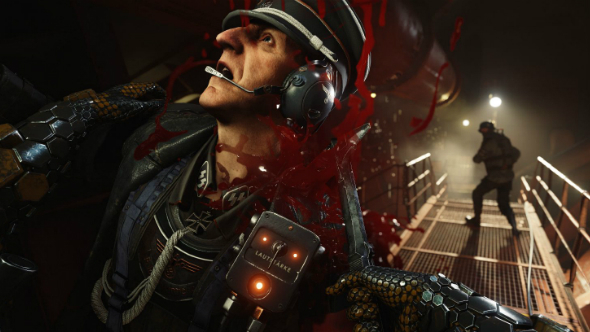 MachineGames explain why Nazis are so fun to shoot in Wolfenstein II. PCGN: How’s everything going post launch? Jens Matthies: It’s very good. It’s a career first for us to ship our game on schedule [laughs]. That’s been a long-time coming. Not only is it the first proper sequel that we’ve made, and the first game we’ve shipped on time, but we also shipped the game we wantedto make. And the reception has been incredible – I’m really happy about that. Has that given you more confidence when it comes to releasing the next chapter? Well, I think confidence is a hard thing to quantify when you’re engaged in a creative business, because you’re always consumed with self-doubt. But at the same time you need survival strategies. Mine has always been to become as knowledgeable as I can about why I construct things the way I construct them. So once they’re done, I am extremely confident in them. Then it doesn’t really matter if people object to them for various reasons, because I know they haven’t thought about it as much as I have – I have this kind of knowledge advantage, if that makes sense. So yes, I am as confident as I can be in a situation where you’re constantly consumed by doubt. With that in mind, when are you adding a battle royale mode? [Laughs.] It would be a pretty tall order. What do you think about the rise of the battle royale genre? People respond to market incentives, right? There’s nothing really unusual about that – that’s always been true, and it’s always going to be. There are, for sure, a number of games where that has been incredibly successful, so I’m not surprised that other people want to try it. It’s brought about suggestions that single-player modes may – again – be in jeopardy. What’s your response to the re-emergence of that fear? I consider myself to be an artistic person, and there are things that I gravitate towards and really enjoy. But at the same time in many ways I kind of an extremist when it comes to the kind of culture I consume. The music I listen to, almost nobody else listens to, and there are some very peculiar movies that I get into that other people don’t. I also have an unendinghatred of the Transformers movies. But they are making billions worldwide, so who am I to [criticise that]? If that’s what they are doing, then that’s what they need to do. The advertising campaign for Wolf II was bold, to say the least. Are you happy with how it played out? Yeah, I mean… all of Bethesda came together in a really spectacular way in shipping this game. It’s incredibly rewarding as a developer to have that kind of support from an organisation. It’s not an easy game to market. I mean, if you are a big publisher, to confidently support a project like this is not something that comes easily. So I feel incredibly blessed to be in this organisation where it’s even possible, because I don’t think any other publisher would even let us do it. Some publishers are deflecting the suggestion that their games have political messages. You guys did the opposite. Well it might be a little bit different for us, because our game is decidedly anti-Nazi. There’s no room for interpretation, right? That’s what a Wolfenstein game is. So there’s no real risk of alienating Nazi gamers – they are already firmly alienated from the game. But I’m not so sure that’s the case for the Far Cry people. I’ve been trying to keep really supportive, because I’m really looking forward to playing it. But it’s conceivable at least that whatever controversy that game has the potential of courting would alienate some significant portion of its potential fan base. And so I would imagine that there’s a marketing incentive to try to avoid that. How did you feel about the bizarre backlash from people who were, in fact, alienated by the game and its marketing? Some people write to us, and you can get approached, and some people spot me. And I don’t really know what to do about that because I’m under no illusions that what we do is guaranteed to get a fair shake from everybody. And I don’t think that courtesy extends to anyone, really. I think if everybody who criticised something, spent the time to know and understand it, we would live in a drastically better world. But I don’t think anybody would do that. There’s not enough time, basically, for a human to care to that degree. So you hear something, it sounds like it might be true, you maybe agree with it. There’s this spectrum where there’s one kind of person who fundamentally disagrees with me because they might be some kind of political extremist, right? And that’s just the way it is. There’s nothing we can do about that. And then there’s another kind of person who has a misunderstanding of the game. And that could be for the fact that they didn’t play it or they may have read it in a way that wasn’t intended, and that could be our fault. But we did the best we could, so the game is what it is and there’s nothing we can really do about that either. So, I dunno… I feel really strongly that the game we made is incredibly close to what we wanted to do – it’s as close as you can make it in reality. The game is what it is and people are allowed to have opinions. And, of course, if I were to engage with those opinions to a large degree then I would just be depressed and spend all my time writing stuff on the internet. And that’s not how I choose to spend my life. Yeah, we’d rather you spent your time making games. Yeah that seems like the more productive approach, right? How do you feel about the Trump administration’s findings on violent videogames? We thought we had crossed that bridge. But I guess for us to truly get away from that we need some kind of new form of entertainment. That can be the new bad kid, you know? [laughs]. So somebody needs to come up with a combination of videogames and death metal or something, and maybe some other weird thing in there, and thatwill be the new scapegoat. But I’m not the kind of person who thinks it’s not valuable to have a conversation, because I think it is. But I don’t think our game is for kids, and I think it’s good we have age restrictions – our game is very clearly intended for an adult audience. I dunno what else I have to say about that. I don’t think there’s any real merit to their position. So it’s not something you worry about, even given the profile of the meeting? Right, right. Well I think about it like this: videogames are a million times less bad, in every conceivable way, than let’s say alcohol. But there is absolutely no way alcohol is going to get banned, because it enjoys a tremendous amount of public support. And I think if anybody tries to ban videogames they would have a significantly harder time of it than banning alcohol. So I’m not really worried about it in that sense. There are so many gamers that would vote differently if that happened. So I feel like there isn’t enough support within a culture to make that kind of thing happen. Sure. Finally, then, what are you focused on at the moment? And what are your next priorities? Yeah, we’re always keeping busy – we have a Switch version coming out soon. And beyond that, of course….